Mavallipura village is located about 15 Kilometer away from Bangaluru (Bangalore). 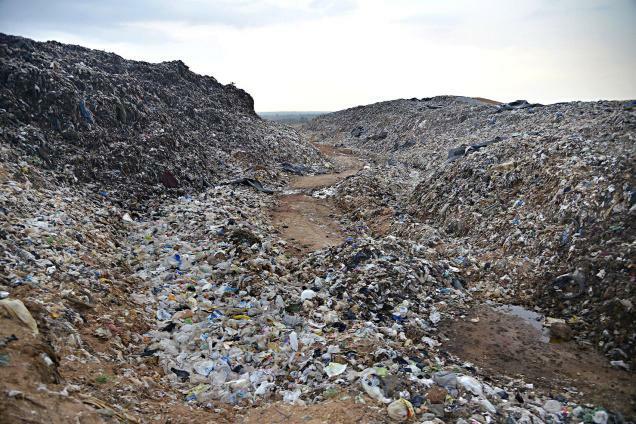 About 100 acres of land in and around the village are used for dumping Bangalore's municipal waste by the Bruhat Bengaluru Mahanagara Palike (BBMP– Greater Bangalore Municipal Corporation). In 2007, BBMP signed an agreement with M/s Ramky Environmental Engineers, a Hyderabad based company, to manage the waste collection and disposal. Since then, Ramky Environmental Engineers used to dump more waste than the landfill's capacity. In 2007, villagers alleged that the site is unregulated and did not adhere to the municipal Solid Waste Management Rules. According to them the company just collects and piles the untreated garbage at the site. As a result, the waste and its toxic chemicals are polluting nearby ponds lakes and even the ground water. The water hence polluted may even cause severe pollution to the Bangalore city’s water distribution system . The site is also very close to the Yelahanka Air Force Base. Generally the Municipal Solid Waste Management Rules says that landfills cannot be located within 20 kms of any airport. Although it has not been confirmed, a number of Air force plane crashes may be responsible for the birds flying over the site  Local villagers are consistently against the dump site and the pollution caused by the site. There are many reported cases of severe health problems and even death of villagers. Also, the effect of pollution has been observed in the low agricultural productivity and on the domestic animals. Affected villagers formed an organization named “Dalit Sangarsh Samithi” to protest against the uncontrolled waste disposal. The organization already started in 2005, with a first major representation against such criminal pollution. Residents of Mavallipura and 12 other villages north of Bengaluru are demanding a CBI inquiry into the city's garbage contracting system. This follows the decision of the city corporation, Bruhat Bengaluru Mahanagar Palike (BBMP), to restart dumping of waste in the lanfill at Mavallipura by overturning the decision of the Karnataka State Pollution Control Board (KSPCB). The board had closed the landfill on July 11, 2012 because it was being operated in violation of environmental laws. In its closure order, KSPCB had instructed Ramky to completely process the accumulated waste for composting within three months in a scientific manner, or face criminal action. However, Ramky and BBMP failed to comply with this order. What's more, BBMP did not take any action to work with communities to cut down waste generation, promote segregation at source and thus prevent the need for disposing of waste in landfills. Instead, the civic agency preferred to divert waste to other landfills, resulting in protests from villagers there as well. 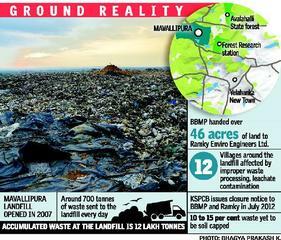 Despite KSPCB legal order, on August 23 BBMP deployed 600 policemen to force open the landfill. Local community tried to prevent garbage trucks from entering the landfill site. Due to the brutal reaction by police forces, one of the activist died for the shock. His family did not receive any apologizes nor compensation from the government. When the family and the other activists declared that the body would not be cremated till BBMP pays compensation to the relatives of the deceased and a CBI probe is ordered into the garbage contracting system, police took away his body and tried to cremate it. The protesters did not give up, and finally obtained a meeting with deputy mayor of Bengaluru, who promised a Rs 1 lakh compensation to the bereaved family. He also promised a meeting with the community leaders on the question of the landfill some days later. According to Down to Earth magazine, the crisis appears to have at last shaken the administration into action. At a joint statement issued in this connection, several city non-profits, including Environment Support Group, Solid Waste Management Round Table, SAAHAS and Dalit Sangharsha Samiti has said that villages around Bengaluru have been victimised for the city’s massive waste production to the tune of 5,000 tonnes per day (Mavallipura was receiving about 1,000 tonnes per day). Residents of villages around various landfills are suffering from a range of infectious and chronic diseases; toxins leaching from the waste is polluting their land, water and air. The statement called for proper implementation of segregation at source, which will considerably reduce the load of waste. It also demanded criminal action against bulk waste generators, who generate 40 per cent of the city’s waste, if they fail to segregate. It called upon the BBMP to immediately make public its policy on Integrated Solid Waste Management and begin comprehensive implementation of measures therein. The facility has been running even when its license had expired in December 2010 . BBMP did not take any action to work with communities to cut down waste generation, promote segregation at source and thus prevent the need for disposing of waste in landfills. Instead, the civic agency preferred to divert waste to other landfills, resulting in protests from villagers there as well. A year after its closure in 2013, the company wanted to make the site operational again. Ramky Environ Engineers was coming out with a waste-to-energy project, which burns almost 90 per cent of waste with least emission. The rest of the waste will be used for making ‘environment-friendly’ bricks . As per Sept 2014, the BBMP again proposed to reopen the landfill for wet waste but residents declared they would not, at any cost, allow the BBMP to dump fresh waste at the landfill. They would only cooperate with the BBMP if the accumulated waste was processed. A good news is that the new proposal by BBMP and Ramky company acknowledges the need to lessen the burden on landfills. 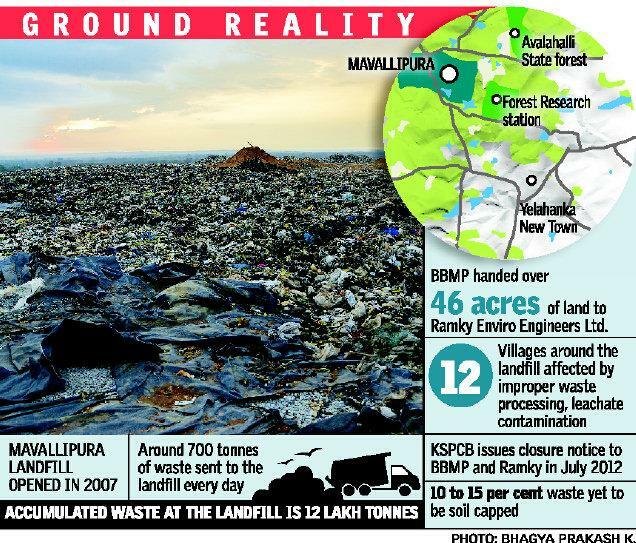 Project Details The Mavallipura village landfill site is located on the outskirt of Bengaluru (Bangalore). The landfill, opened in 2007 can sustain about 500 tonnes of waste. However, the BBMP has been sending almost 1,000 tonnes of garbage from Begaluru city every day. They demand that the landfill site must be stopped immediately as it is illegal and unscientifically managed. The waste accumulated over the years must be taken out from the place. Measures must be taken to purify the water of the nearby lake (Mavallipura lake) to protect people and cattle from further contamination. Regular health check of residents must be conducted immediately and the necessary health care should be taken for the affected villagers. False cases filed against the activists must be withdrawn immediately. They demanded CBI (Central Bureau of Investigation an independent investigation agency of government of India) inquiry into the city's garbage contracting system . Monitoring committee is to be formed to implement and oversee all these demands to be fulfilled . The statement issued in August 2012 before the meeting between the community and the deputy major called for proper implementation of segregation at source, which will considerably reduce the load of waste. It also demanded criminal action against bulk waste generators, who generate 40 per cent of the city’s waste, if they fail to segregate. It called upon the BBMP to immediately make public its policy on Integrated Solid Waste Management and begin comprehensive implementation of measures therein. Why? Explain briefly. After a long struggle The Karnataka State Pollution Control Board (KSPCB) has ordered the city municipality, Bruhat Bengaluru Mahanagara Palike (BBMP), and private operator of the landfill, Ramky Infrastructure Pvt Ltd, to stop the facility in July 2012. The pollution control board has also ordered the operator to find alternative sites for dumping waste. But new pressure has been put on other landfills around Bengalore. As per August 2014, BBMP has come up with a proposal for an holistic approach on waste disposal  but the results of this is still to be seen.